Arts and crafts are a great way to pass the time, improve motor skills, and flex creative muscles. In recent years, the toy industry has started to recognize the value of creative-based play and many companies have released kits of fun, unique, and innovative art supplies. Below is a round-up of some of the best new art supply kits that are on the market in 2019. 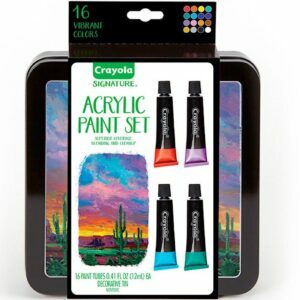 Signature Pearlescent Acrylic Paint:Crayola Signature Pearlescent Acrylic Paints offer vibrant colors that give off a shimmery gloss finish. These paints contain a multidimensional pigment that provides superior coverage. Set includes mixing wells for easy color blending. This stylish set comes with 16 Acrylic Paints and 3 Re-usable Paint Mixing Trays in a Decorative Storage Tin. It retails for $14.99. 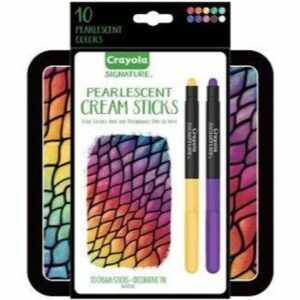 Signature Pearlescent Cream Sticks: Lay down these Cream Sticks in 10 pearlescent colors and glide their creamy texture across paper,especially on dark backgrounds where the shimmer and shine is most vibrant. Enjoy less mess, too! Unlike traditional oil pastels, their pen-style casing and twist up core allows them to be held without color rubbing onto hands. Plus, caps and clips keep these coloring supplies protected and ready for on-the-go use. Now that’s smart art! It retails for $15.99. 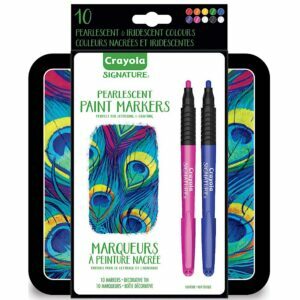 Signature Pearlescent Paint Markers: With 9 Pearlescent Permanent Markers and 1 Iridescent Marker, this Signature Paint Marker Set brings a satin finish to a variety of surfaces. Teens and adults can use these quick drying Pearlescent Markers on glass, plastic, wood, terra cotta, canvas, and metal, then overlap the Iridescent Color Changer for added dimension and special effects. The entire collection helps art projects pop, especially on darker backgrounds! Plus, the Markers in Pearlescent Paint Colors are neatly kept in a Decorative Storage Tin, making this beautiful set a ready-to-give gift. It retails for $19.99. 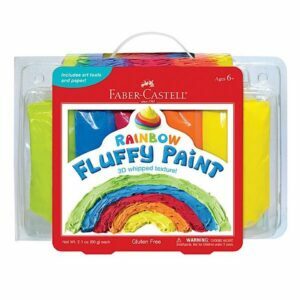 Rainbow Fluffy Paint: It’s like painting with fluffy frosting! 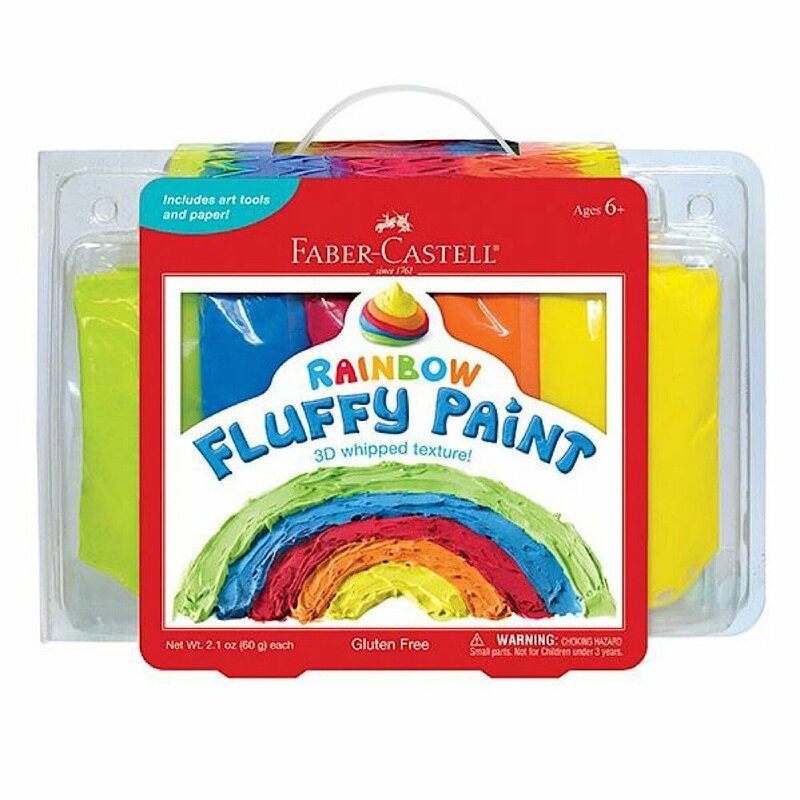 Mix, layer and design in dimension with this vibrant set of fluffy paint! Use the texture card to create patterns or the stencil to make 3D dots. Use the included tools included to smear and scratch, creating a striking drawing or blend your colors together to make a rainbow! Paint dries quickly, holding a 3D effect. It is recommended for kids ages six and older and retails for $17.99. 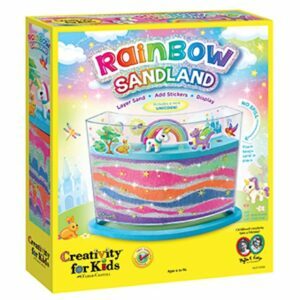 Rainbow Sandland: Remember the fun of sand art? This classic kit includes TWO super trendy themes- rainbow and unicorn. Simply layer the vibrant colors of sand and sparkling glitter inside the clear container. Use the design tool to create lines and patters in your sandscape. Top the sand with the handy seal, then add your friendly unicorn and stickers to complete your sand art. It is recommended for kids ages six and older and retails for $17.99. 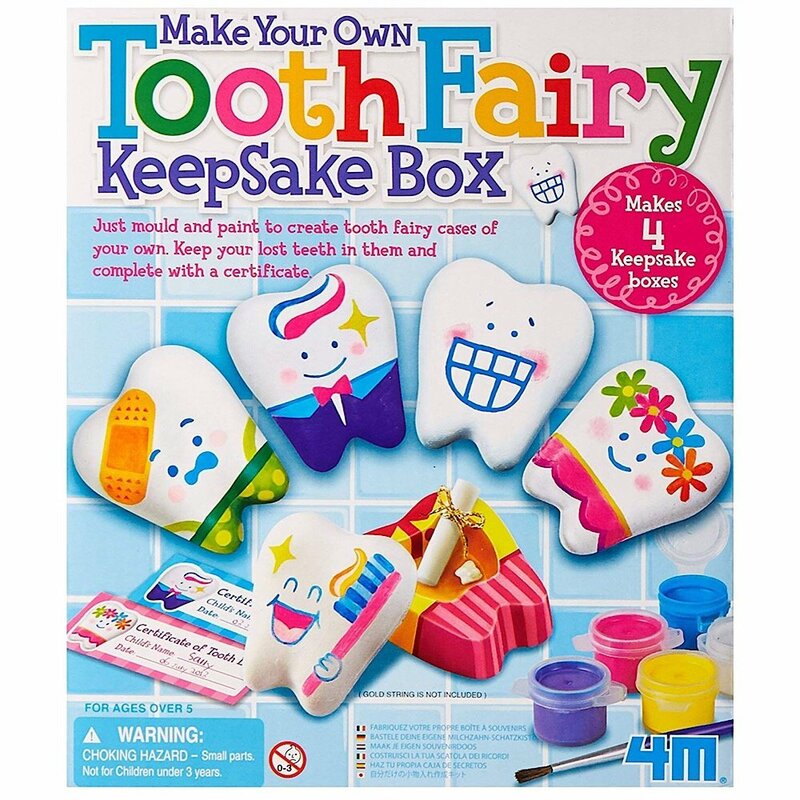 Tooth Fairy Keepsake Box kit by Toy Smith. Tooth Fairy Keepsake Box: This set is a fun arts and crafts project for keeping lost teeth safe. Mold and paint a unique plaster keepsake box for storing lost baby teeth. This kit includes two bags of plaster, a tooth fairy mold set, five (5) paint pots and one (1) paint brush. Certificates are included to mark the child’s name and record the date that the tooth was lost. Detailed assembly instructions are included and it is recommended for ages 5 years and up and retails for $9.99. Paint Your Own Russian Doll set by Toy Smith. 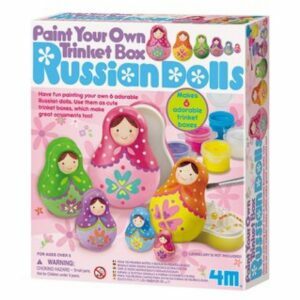 Paint Your Own Trinket Box Russian Dolls Kit:This Set enables kids to start a hobby that will last a lifetime with the 4M Paint Your Own Trinket Box Russian Doll Kit. This fun kit is ideal for building any young artists’ creative skill with results they’ll be proud to show off. It comes with six paintable doll-shaped trinket boxes that can nest inside each other or hold secret treasures. You can design and paint 6 doll-shaped trinket boxes with the included paints and brush. This set serves as a great indoor activity for a kids party. These cute dolls can be nested together or used individually as trinket boxes for small treasures. It is recommended for ages 5 and up and retails for $12.99. Paint Your Own Mini Piggy Bank by Toy Smith. 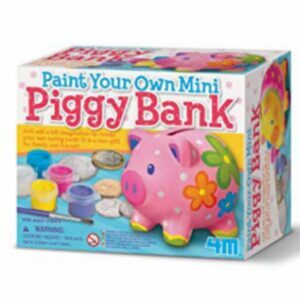 Paint Your Own Mini Piggy Bank: Start saving in style with the 4M Paint a Pig Bank. Add a bit imagination to this piggy to create your own personal savings bank. Everything you need to customize comes in this set including a paint strip, brush, and instructions for use. At 3-1/8-inches tall, this kid’s bank fits perfectly on your child’s dresser or desk. It serves as a great gift for young family and friends. Made using safe and high-quality materials, this product is designed to last. It is recommended for ages 8 and up and retails for $11.99. Paint Your Own Mini Magnetic Tiles by Toy Smith. 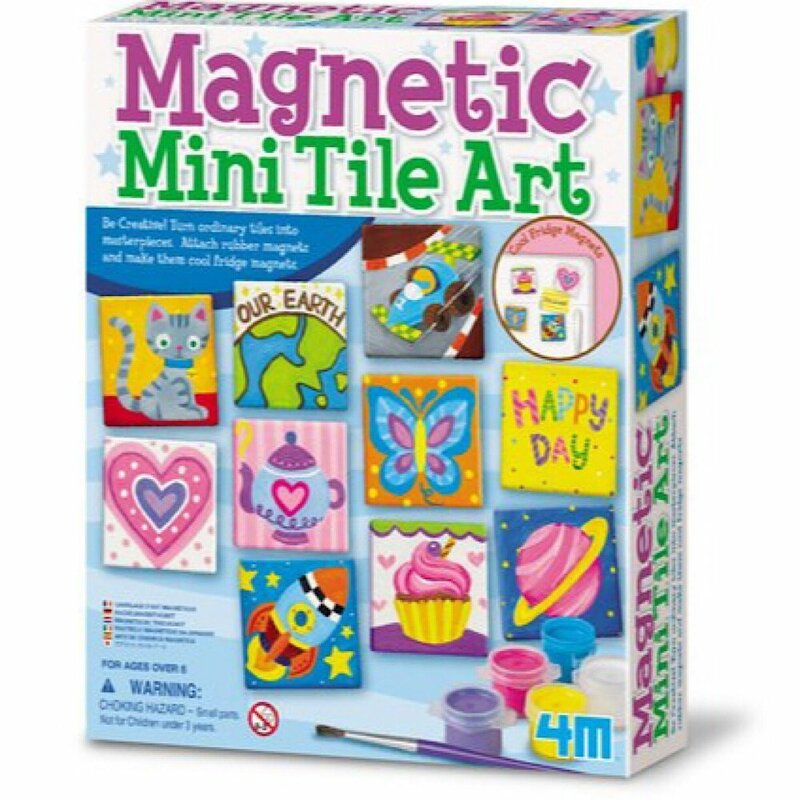 Magnetic Mini Tile Art: Explore the fun of arts and crafts with the 4M Magnetic Tile Art set. Create works of art, attach them to tiles and apply magnets to hang them on any metal surface. This magnetic tile art set includes tiles, magnets, a paint strip and brush. Tiles make ideal fridge art, or can be safely attached to a locker door for a unique personal touch. Each tile measures 2-inches by 2-inches, making them attractive gifts for friends or family. It is recommended for kids ages 8 years and up and retails for $11.99.